We are the only full-service Sauna Builders in New England, and offer experience in all phases of Sauna design and construction. Although limited by travel-time to work in our local area (N.Y.,Vt.,N.H.,Me.,Ma.,and Conn.), we can do design consulting and plan-check services virtually anywhere via e-mail, fax, and surface mail. 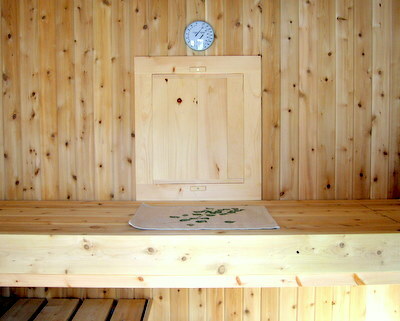 At Solhem, technical solutions for the control of heat loss and vapor transmission are based on time-proven techniques and Finnish Sauna specifications. From the traditional log' Bastu' with wood-heat to the digitally-controlled modern electric Sauna, Solhem Sauna clients are assured of the very best performance and a low-maintenance design that will provide years of trouble-free use. We can provide heating equipment, accessories, and amenities from top-shelf Finnish and American manufacturers, and work with appropriate trades-people on-site for a timely and expertly executed installation: You will own the best and most authentic Sauna available. With over 30 years of field experience as a builder and designer and over 20 years of Sauna work, Solhem Saunas have received the highest compliments from all of our clients. Does your design program require Green Building and Design Techniques using Sustainable Design/Construction choices? At Solhem, we can and do provide options that satisfy these requirements, and have been involved in this field for many years. We are happy to deliver anywhere. However, deliveries beyond a six hour drive can become costly. Please contact us to confirm delivery options. When I began my building business in the Valley in the middle 80's, my focus was mending antique homes and structures; this was very engaging work, and my clients were dedicated to protecting their historic properties. My focus shifted to Sauna work after building a small prototype for my own family use here in Duxbury. After having a chance to experience the value and benefits of owning my own sauna, the die was cast... In 1990 I printed my first promotional material, and a few years later I gave up the preservation part of my business to begin the full time sauna company. One of the most rewarding parts of the work that I've done over the past 20 years is working with and for really interesting people, locally and from away, learning at each turn more personal and family twists to a tradition that by some accounts goes back twenty centuries... People who appreciate the culture of sauna, the benefits to our health - both physically and spiritually - and understand how important something as simple as a small, sometimes dimly-lit, warm room can be to our wellbeing... And conversations like the one I had several years ago with an architect friend who had visited a traditional log Banya in Russia - or the guys who built a makeshift Sauna beneath an upturned wooden skiff on the beach in Oregon - or the friends who had a pal in Alaska who built his Sauna over a brook, so there was always running water, year-round! The stories and enjoyment go on and on; but as I've pointed out to many in the past: there is a big difference between a beautiful photo of a nicely built sauna, and actually sitting in that warm quiet room, infused with fragrant steam, and the company of friends. It is beyond words - one must try it to see!